BMW and automotive parts supplier Continental are teaming up to produce autonomous vehicles; according to the Continental press release, BMW aims to have partially automated vehicles on the road by 2016. By 2020, it aims to have highly automated cars piloting the public roads, with fully automated cars by 2025. Continental has been hard at work on vehicle autonomy for many years. In fact, U.S.-based Continental representatives testified in front of the Michigan state board of transportation last week, urging local lawmakers to pass a bill legalizing autonomous vehicles in the state. Currently Continental is licensed to operate self-driving cars in Nevada. The BMW and Continental move is essential for BMW to keep up with its competitors. Audi has fully autonomous cars on Nevada motorways presently. Mercedes-Benz is set to debut partial autonomous technology on its upcoming 2014 S-Class. It would appear that although BMW is a bit behind the curve, the German luxury automaker stands to gain a great deal of knowledge from Continental. 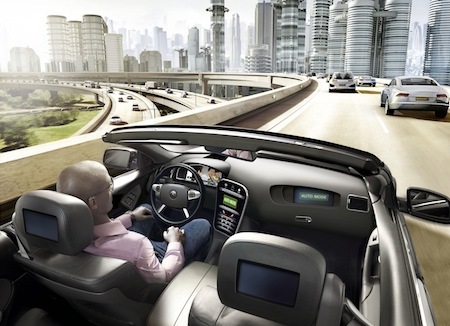 Continental pledges to invest over $1.3-million into vehicle autonomy in 2013 alone. Heinlein fans are in the catbird seat for this trend, having savored the idea of autonomous vehicles since the Camden speedster appeared in his 1941 novella Methuselah's Children.